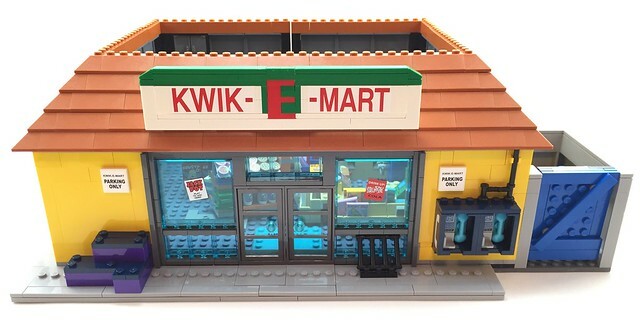 LEGO The Simpsons Kwik-E-Mart review! Alright, so I usually do quick photo reviews when I get new sets. That's what I'll do here, but there's quite a few photos, so I thought I might as well make its own review thread. So, I got the Kwik-E-Mart by paying just2much on an early eBay copy. I think it's worth it, as this week I'm gonna be super busy, so I was able to build it Saturday and stuff. Well, let's get onto this photo review. 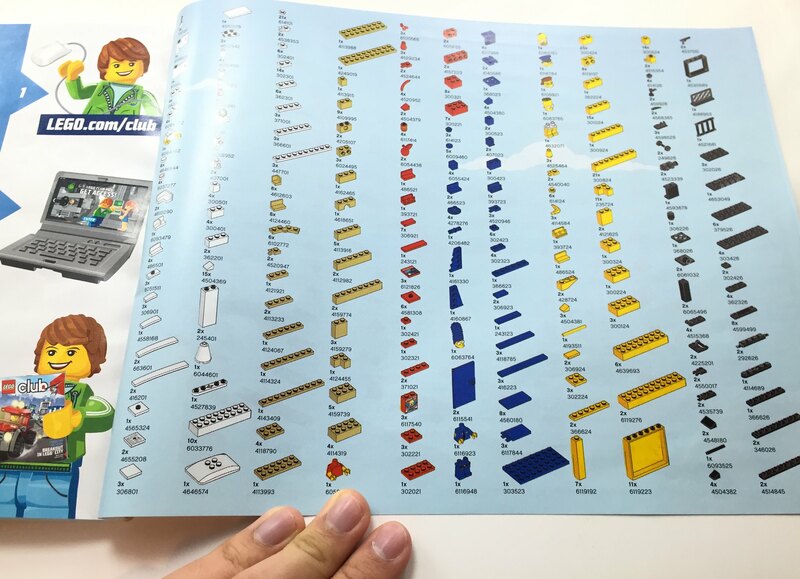 The set is $200 USD with a little over 2100 pieces. The official release is April 15th for VIP members, May 1st for everyone else at LEGO Stores. And, if you want full size pictures, check out my Flickr by clicking here. The minifigures included are great. You get three exclusive minifigures (one being a completely exclusive character- the first time LEGO has ever put an exclusive mould in a Direct to Consumer set), and you get three of the series most popular characters in their normal attire for those who missed out on the first Simpsons minifigures series. The Kwik-E-Mart's exterior is loaded with lots of sticker details. The only printed detail you'll see in the exterior is the dial pad in the phone booth, which has appeared in some other licensed themes since last year. 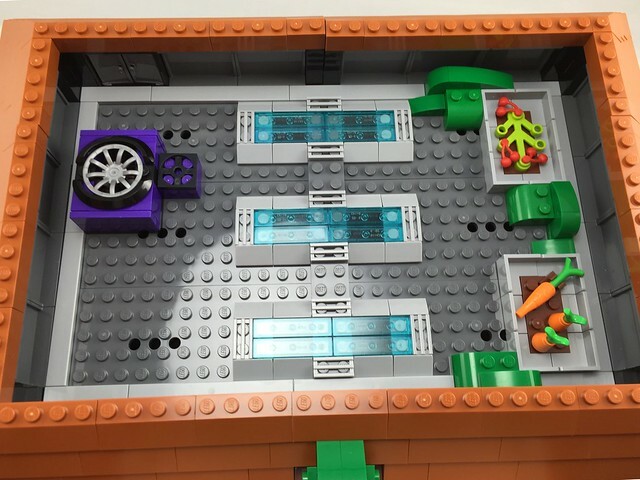 The roof of the store includes the garden shown in the Paul McCartney episode. 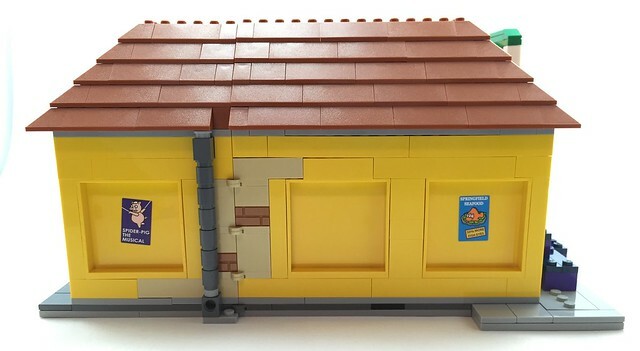 The roof can be slided out/in once you open it with the hinge part. Also included are some awesome printed pieces, and two unprinted coffee cups! Honestly, I think this set is perfect. The price is fantastic, and has a great PPP ratio. They really went above and beyond by including Snake in this set. 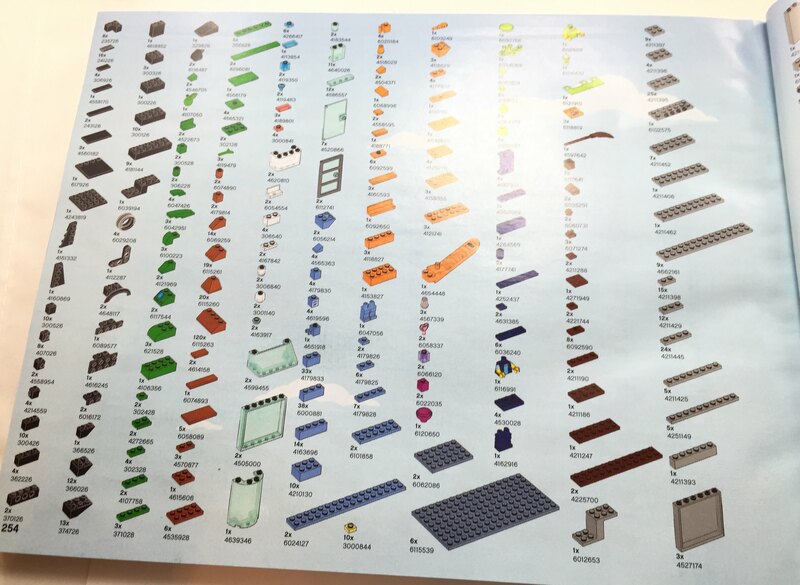 I honestly think it's better than the Simpsons House in terms of accuracy and the value here- so many cool pieces printed and in exclusive colors. So, that's my quick picture review. Hope you guys enjoyed, and I'd love to hear your thoughts! 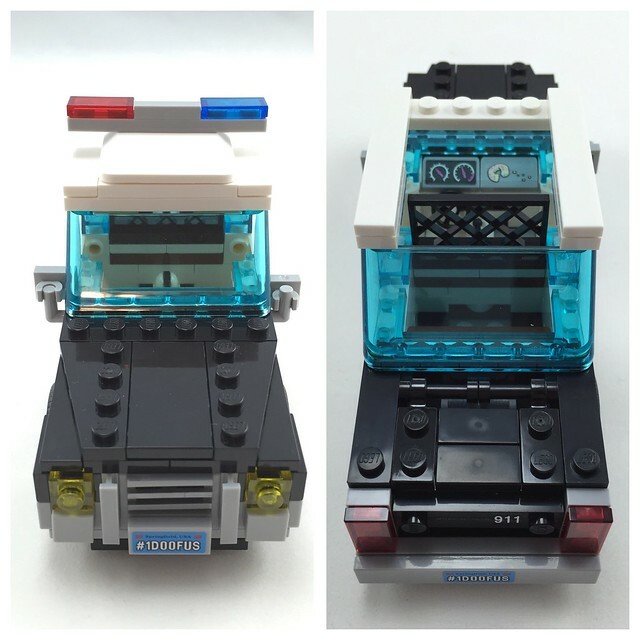 Thanks 'j2g' for another review, one of my favourite parts of the set......the half eaten donut on the dashboard of the police car. 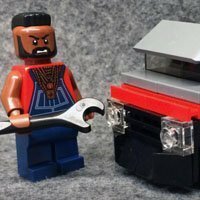 Brick On Review On 'j2g' ! Thanks for the review, your video was very well done, seeing those sticker sheets is daunting. 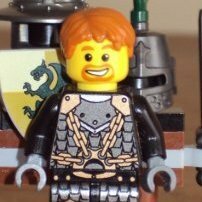 I can't help but think the minifigures are the weak part of the set. Snake and Apu are great but the rest.... I don't know. They kinda redundant now. They could at least give us new torso printing, like Homer wearing his jacket or Bart wearing his blue t-shirt or Marge wearing her coat. Or, as I said in the discussion thread, I'd have included Jasper in CMF series 2 and a Frozen version here. Overall, the set looks kinda smaller than what I thought. Thanks for all the feedback you guys! I agree, but so many people were complaining about how The Simpsons House should have included the most common versions (mostly because the eyes or whatever), so I think LEGO played it safe and just included the normal versions. It makes sense, since Series 1 is gone forever, and the common versions were in there, and this set is bound to be in stock for a very long time like the Death Star. I never really agreed when people were complaining about the alternate eye prints personally, but I guess this is a good business choice based on previous feedback. Hello everyone. Excellent review! English is not my native language, but I want to express my opinion. 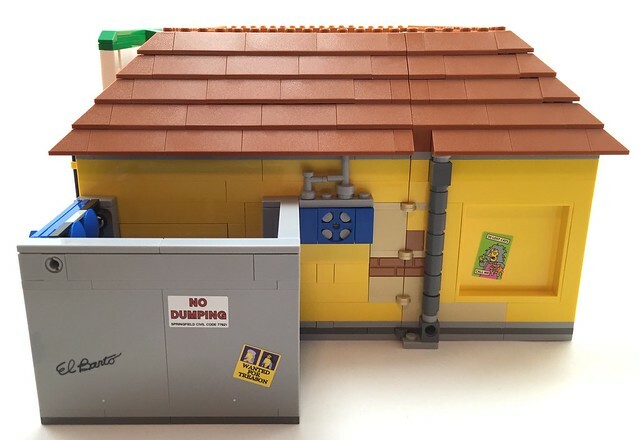 Simpsons house was the first of its kind, and I can say without exaggeration that this is the most impressive set that I'm going (my collection http://brickset.com/sets/ownedby-celeb ). I look at the video from the Kwik-e-Mart, and is difficult to say how good it is compared with the house. and when you open them, you can see the white block is openly trash, my points of view. Boxes on the left of go to the store and powersauce box, i want see make real and not just a cube, f.e. such as in the unreleased Star Wars set. This set is made parking for bikes and it looks very cool. But damn, it is hoped to see the Bart or Lisa's bike, instead of useless balloons with paint. The walls are made with convex inside panels, why so? can anyone know? have not seen any pictures with such walls in TV show. Why did not they turn? I personally really like how realized roof, but my brother says that it is terrible :) garden could do more in the series there were almost jungle I do not know how to be considered here, maybe anyone can express any opinion or idea? 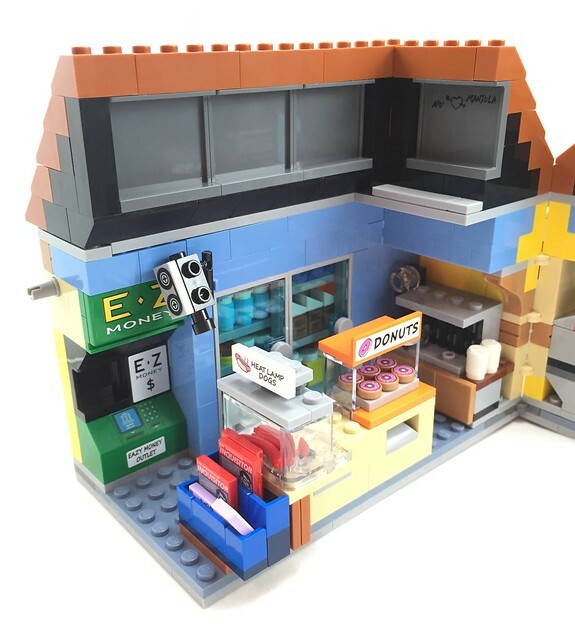 I look at the Simpsons house, and then look at the photo of this e-Mart. 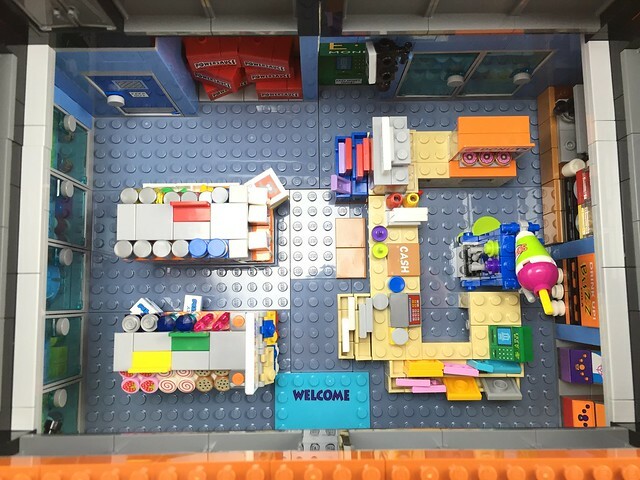 I can not understand, in the house we have a garage, two floors, cool floor, a lot of furniture, all the rooms and walls, collected from cubes, many additional accessories. And where is all this detail here? It looks much smaller (maybe even poorer). If they still will release next year comic book store, it will be even less? Of course it is difficult to estimate without seeing it live, we have it will be sold only in May. At first sight it does not look so impressive as the house. Can certainly the case in the limit on the amount of detail, but why it was impossible to add $ 50 to the cost and make Jasper, the more detailed the roof, the walls of the smaller elements, that it was not convex. Sad. Great review!! Thanks for paying a little extra to get it now and review it for us!!! You must be a youngin'...those phone booths thingys are called "pay phones" :) J/J They're tough to find nowadays. Incredible set, thanks for the pics! So many details and unique prints and colors. 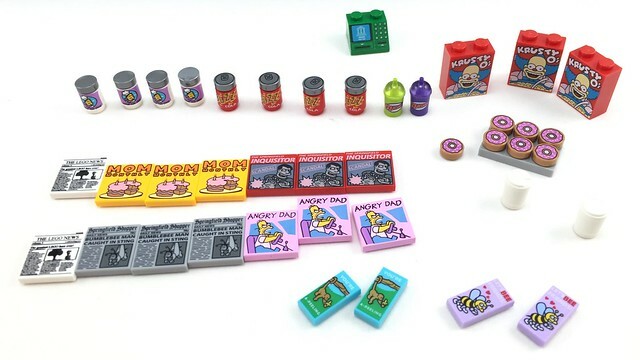 I'm not that into the Simpsons but definitely a top tier set. Thank you all for the great feedback! Soon, but my area with The Simpsons House is very messy, so I will have to make room for it first. Great review!! Thanks for paying a little extra to get it now and review it for us!!! You must be a youngin'...those phone booths thingys are called "pay phones" :) J/J They're tough to find nowadays. I have sooo mixed feeling about that... I loved the Simpsons House (save for the terrible wall in the Homer and Marge's room), but this so far is inferior in almost every aspect. The walls made of panels is a bummer. I expect a D2C set to be better that this. 60+ stickers? The same thing. 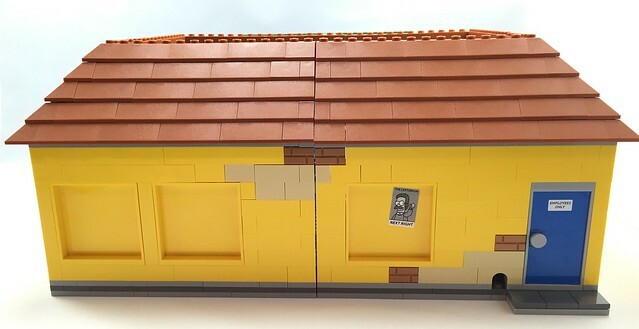 Same price for less bricks and smaller build then the house. Panels again with their fronts facing towards the inside of the shop so we and up with those squares all around. The walls are yellow, this was so nice, lost opportunity to make it in some other less common colour. Then again the set overall looks is good. The roof is a nice detail. 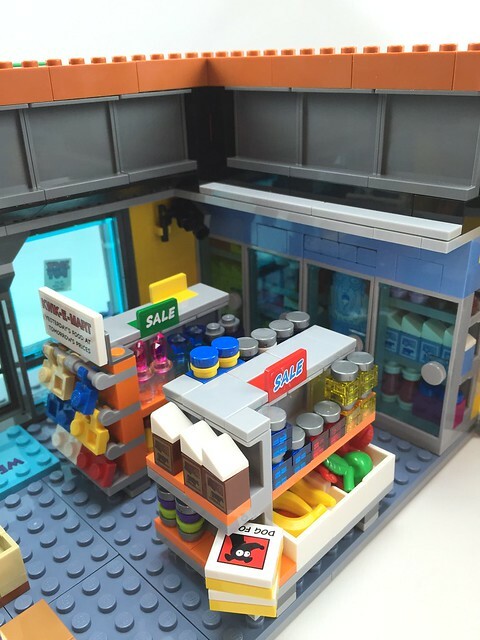 The shop looks actually like a real one, not just an approximation of one. Definitely a must buy... but for a discounted price. I'll try to find one with maybe damaged box or after-display copy. Agreed! Glad my GF likes to do stickers! 60 yikes! But looking at it now I think the tan/yellow is supposed to represent where the paint is fading on the back of the store? I guess? Click for a bigger image. That's actually not bad sizing, IMO. Sure, it looks like you get a lot more with the house, but the Kwik-E-Mart has a lot more of those little references that make it Simpsons. I agree with some of the complaining; a real Jasper behind a trans-blue panel would have been cool. You could always bulk up the roof with more foliage... 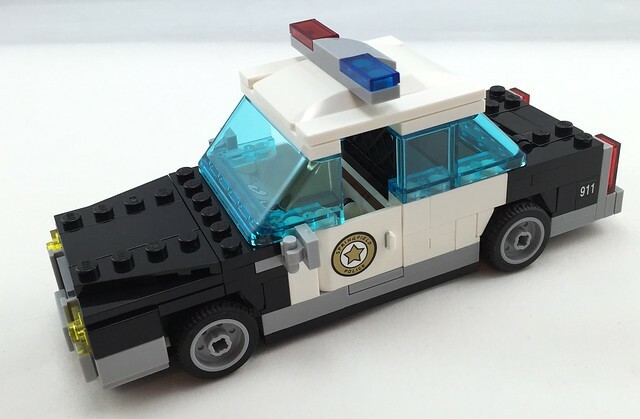 I think it has a great foundation as a set, but could do with a few mods to make it better. 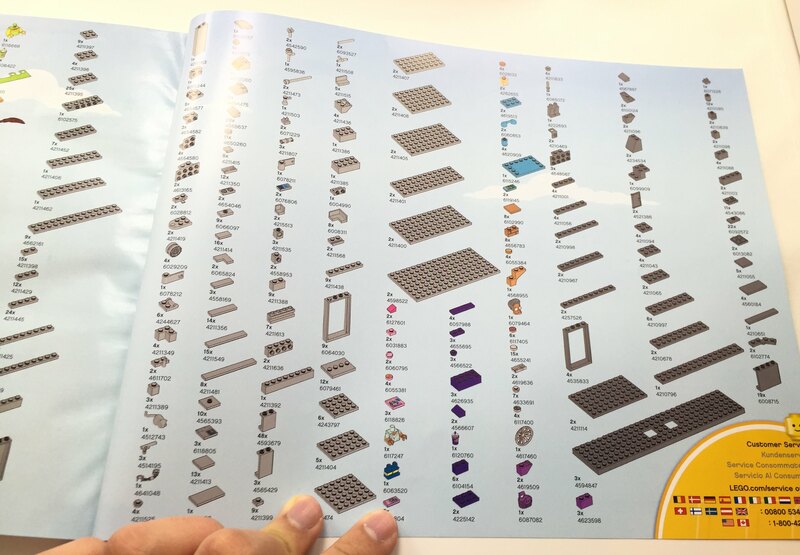 Thanks for the pictures; I greatly appreciate being able to see reviews like this before dropping $200 on a LEGO set. Great Review Just2Good, honestly I love this set lots of great details and references. I'm still hoping that Snake will be coming in the next (wave 3) CMF set. It's the level of detail that floors me, a licensed set with the mindset of those great Creator sets. A helping hand in a petrol kiosk! Nice review! 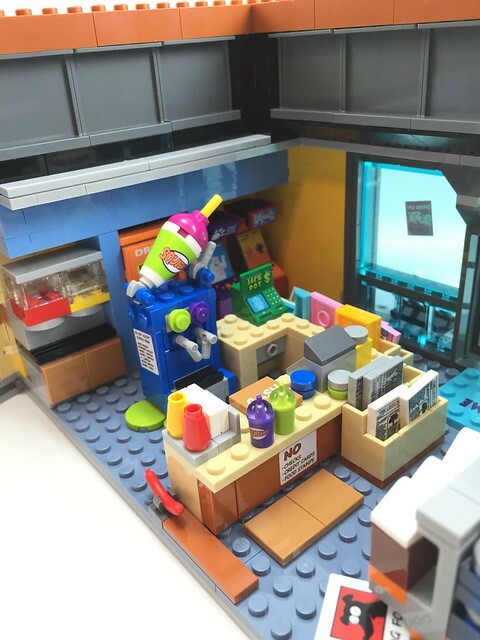 But I have one question: Is the transparent dome of the Squishee Drink removable? 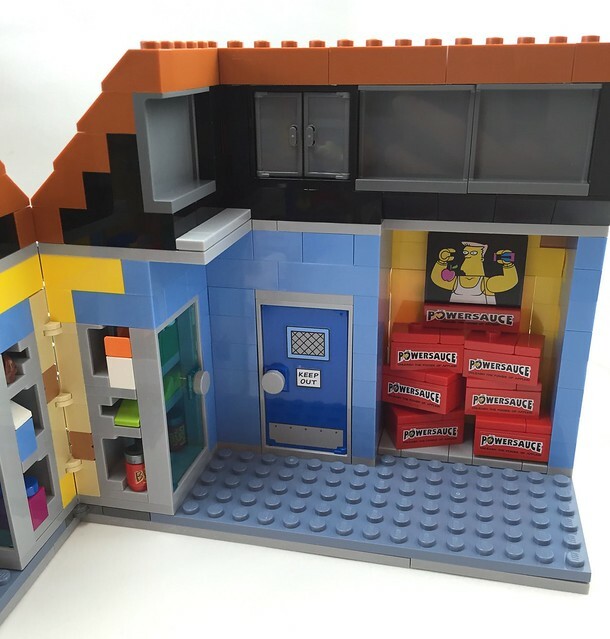 The set is really fun to build, with a lot of little pieces for the fridges. Did anyone else have a problem with the piano against the wall of The Simpsons House? It just kept coming off way too easily and I was getting really frustrated with it sticking out and not fully going on so I had to put the two tiles that hold them one place over away from the wall for it to sit properly without falling out, I think I might put Snowball II behind it since cats love to hide underneath or behind things lol but just curious to know if anyone else was encountering this problem with the previous set.